This October, MoMA presents Henri Matisse: The Cut-Outs, the most extensive presentation of the artist’s cut-outs ever assembled. The exhibition features about 100 cut-outs, including “The Swimming Pool”, a room size work in nine panels made in 1952. 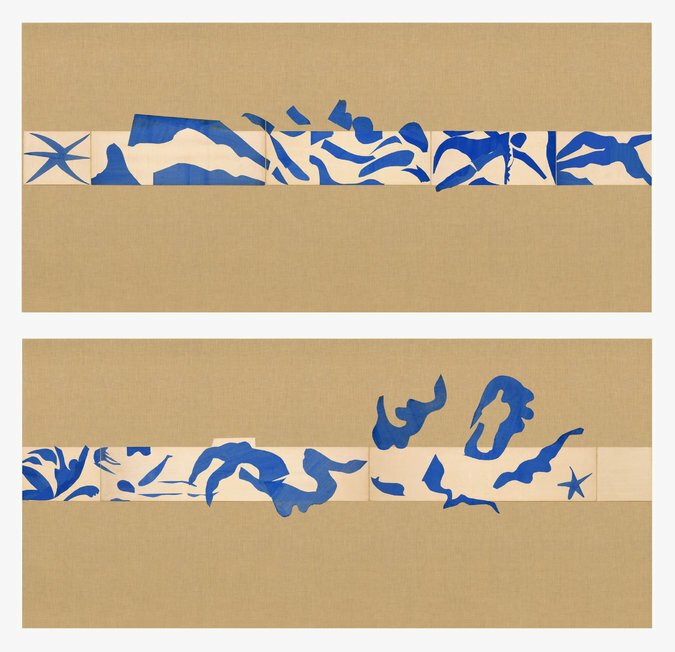 This masterpiece, Matisse’s largest and most ambitious cut-out, has originally been created for his dining room. “The Swimming Pool” is being exhibited for the first time in more than 20 years. Painter, drawer and sculptor, Henri Matisse was an influential artist of the 20th century. He was the precursor of the fauvism movement in art. He took instruction at the Ecole des Beaux-Arts in Paris and began his career painting still life. In the beginning of the 20th century, inspired by the work of George Seurat and Paul Signac who painted in a “Pointillist” style, he painted canvases such as Luxe, calme et volupté (1904-05). In the late 1940’s, he started making cut-outs, mostly shaping human figures from blue paper and pasting it to wall-size background white sheets.